Moonlight is a young Throughbred horse who is responding very well to being clicker trained. Gorgeous horse, beautiful photo, and amazing that he's responsive to the clicker! Is he yours? Love the name! @Weezilou no Louise, not mine. She belongs to the people that I ride with each week. Their son, who is an absolute natural with the horses decided that he wanted to try clicker type training. She's an ex race horse so very much used to being ridden with a full bit and bridle. Spike has been able to ride her with just a halter that has a rope attached to it as if it was a rein. It is just amazing to watchthe two of them together. Wonderful horse, love the movement! I clicker trained one of my golden retrievers and it worked beautifully! Good for a horse too - they would hear it from a distance! 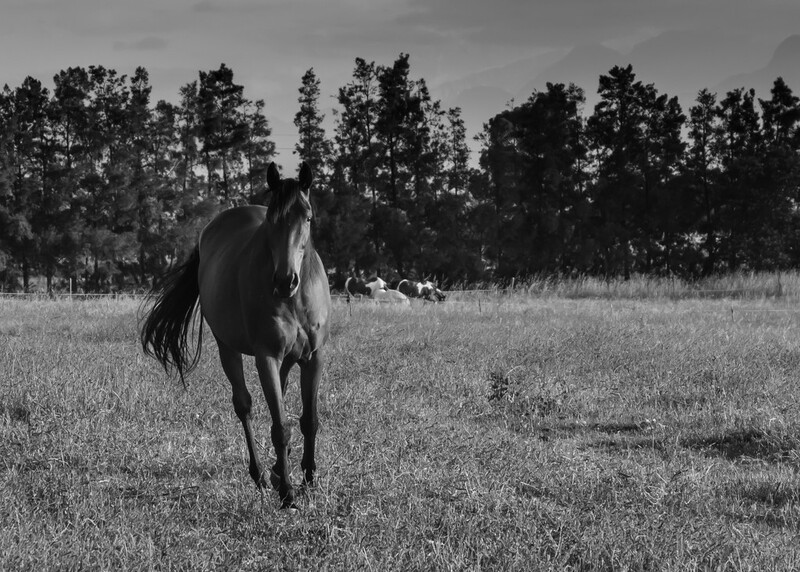 What a beautiful horse- even more so with the black and white treatment. Great shot! such beautiful creature and has that regal bearing. fabulous! hi Sallly , I wonder if you have ever tried to do any astrophotography, I have been having a lot of fun with it and I think you probably live in an ideal place to try it, as long as you get a fine night this week, this is a video about it if that is a good way to learn for you, https://www.youtube.com/watch?v=IkLaTdfIAv8 what is the forecast like for this week? if that doesnt suit I will give you something else. Beautiful horse and capture. the b/w suits it perfectly too. @kali66 thanks Kali, sound like a great challenge. Thanks also for the link, I will check it out. Now I must dream up a challenge for you.